Welcome to SitcomsOnline Digest! It took a while, but we finally got the first cancellation of a show for this season, we have news (although it is too late to take part in it now) of fast food chain White Castle paying tribute to a famous Thanksgiving episode of a sitcom with a special "turkey drop" contest, and news of more Evening Shade on DVD. Let's get going! VEI has been very busy with a lot of complete series lately, and this week, even more were announced. For sitcom fans, however, there is really only one of interest: Evening Shade. No date has been given for this release yet, and we suspect that it won't arrive until later next year. Cristela - The Complete Series (DVD, $29.95): It may have only survived for one season on ABC, but now, fans can own that one season on DVD, as a MOD release. 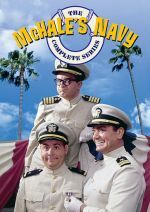 McHale's Navy - The Complete Series (DVD, $169.99): Shout! Factory released the entire series on DVD several years ago as individual season sets, but now they are compiling the entire series into one set. Sgt. Bilko (The Phil Silvers Show) - The Complete Final (Fourth) Season (DVD, $29.99): Shout! Factory wraps up this series, previously released as a complete series, with this final individual season release. Who to Follow: Angela Kinsey (Twitter), "Mom. Owner of nutty pets. Actress. Flip flop wearer." Claim to Fame: Angela Kinsey came to fame to most people from her role of Angela Martin from The Office. But before that, her career began with an internship on Late Night with Conan O'Brien. She had a few guest roles here and there on King of the Hill and Step by Step, but in 2005, she was thrust into the spotlight on The Office, which was sort of an unexpected hit for NBC. Since then, she has made a number of appearances elsewhere, and was most recently in a role on the TBS series Your Family or Mine, which didn't exactly get a lot of attention and has already been canceled. Now, she is writing, and may possibly appear, in yet another TBS sitcom.